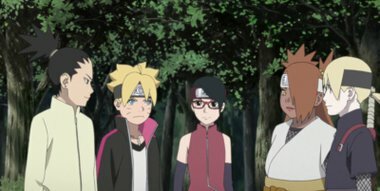 Mitsuki is taken by Hidden Stone Ninjas, Kokuyō, Sekiei and others. Yokuyō* (Kokuyō) and the others are heading towards their home country, the Land of Earth. On the other side, after receiving the information from the White Snake Sage using his power that Mitsuki is headed towards the Land of Earth, Boruto and his group are also advancing towards the Land of Earth.